Each serving contains a blast of Vitamin C plus 9 vitamins, minerals, and herbs The same trusted and loved Airborne formula are now available in fun, delicious, chewable gummies for kids! Airborne�s unique combination of 9 vitamins, minerals, and herbs, along with a blast of Vitamin C, will support your childs immune system. 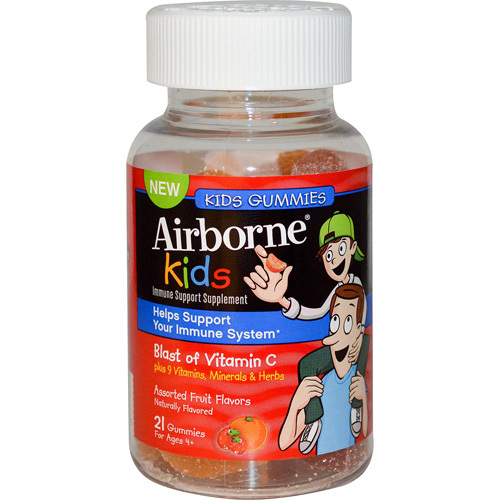 Fruit-Flavored, Vitamin C Gummies for Kids with Airborne Immune SupportAirborne Gummies are deliciously flavored, easy to chew, and fun for children. Two gummies contain one serving of the Airborne formula kids love. Vitamins, Minerals, and Herbal Extracts Provide Immune SupportThe key ingredients in Airborne Gummies support immune health. The blend of herbs works together with carefully selected vitamins and minerals to help support your immune system. * Regular exercise, a balanced diet, and plenty of sleep are essential to good health. Vitamins and Minerals Work to Help Your Kids Immune SystemAirborne Gummies is packed with key vitamins to help support your immune health. Chew twp gummies to get 667 milligrams of Vitamin C and high quantities of other antioxidants. Vitamin C is an antioxidant that goes to work on a cellular level to adjust high levels of stress hormones and enhance the function of immune cells throughout your body. Vitamin E inactivates free radicals that can harm cells. Vitamin A, a phytonutrient that works as an antioxidant, promotes immune health and protects DNA. Contains Echinacea and Herbs Extracted from Whole Plant MaterialsEach serving of Airborne contains 23 milligrams of an herbal blend. The Airborne formula contains echinacea, as well as these herbal Ingredients: Lonicera, Forsythia, Schizonepeta, ginger, Chinese vitex, and Isatis. The herbal extracts in Airborne are derived from whole plant materials. Whats in the Box:Airborne Gummies for Kids Immune Support Supplement with Vitamin C, Assorted Flavors, 21 Count.Not for young children due to risk of choking. Always consult your pediatrician before giving your child dietary supplements. * THESE STATEMENTS HAVE NOT BEEN EVALUATED BY THE FOOD AND DRUG ADMINISTRATION. THESE PRODUCTS ARE NOT INTENDED TO DIAGNOSE, TREAT, CURE OR PREVENT DISEASE. Ingredients: Serving Size: 2 GummiesServings per Container: about 10Amount Per Serving % Daily ValueCalories 25Total Carbohydrates 6 g 2% Sugars 6 g *Protein 1 gVitamin A (as retinyl palmitate) 133 IU 3%Vitamin C (as ascorbic acid and sodium ascorbate) 667 mg 1,112%Vitamin E (as d-alpha tocopheryl acetate) 6.7 IU 2%Magnesium (as magnesium oxide and magnesium sulfate) 6.7 mg 2%Zinc (as zinc oxide) 0.67 mg 4%Selenium (as selenium amino acid chelate) 10 mcg 14%Manganese (as manganese gluconate) 0.067 mg 3%Proprietary Herbal Blend 23.3 mg * Maltodextrin, Lonicera japonica (flower), Forsythia suspensa (fruit), Schizonepeta tenuifolia (aerial), Ginger [Zingiber officinale (root)], Vitex trifolia (fruit), Isatis tinctoria (root), Echinacea purpurea (aerial)Proprietary Amino Acid Blend 3.3 mg * L-Lysine hydrochloride, L-Glutamine* Daily Value not established.Percent Daily Values are based on a 2,000 calorie diet.Other Ingredients: Corn syrup, sugar, gelatin, natural flavors, colors from fruits and vegetables, pectin.Always consult your pediatrician before giving your child dietary supplements.